Mike is a proud father, lucky husband, passionate author, viral blogger, degreed engineer, decent impressionist, inept hunter, erstwhile jock, and nerd. 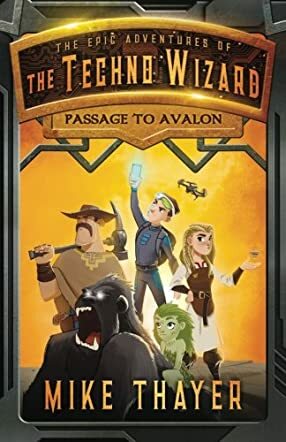 Passage to Avalon: The Epic Adventures of the Techno Wizard, Volume 1 by Mike Thayer is a middle grade Wizard of Oz-esque book that will appeal not only to young readers, but to adults who want to escape reality for a bit and enjoy an adventure in a magical world very unlike our own. Sam, the main character, is a thirteen-year-old boy who gets transported to Avalon after an earthquake hits his hometown of Bozeman. In Avalon, he meets bandits, a talking tree girl, and an evil emperor/wizard who wants to kill him. He also learns that he's not only immune to aether, but he also has the ability to destroy it. Talk about having a strange day! This book is a hilariously epic journey as Sam tries to find his way out of Avalon and back to Montana. Mike Thayer has struck gold with Passage to Avalon. I expected a book for children, but what I found instead was a book that can be read by anyone at any age. I loved the Wizard of Oz vibes as Sam was transported to Avalon, and the quest he finds himself on soon after his arrival. There were twists and turns that I didn't see coming and the characters were expertly crafted. A favorite of mine was, without a doubt, Sam's tree-girl friend, Willow. Her innocence was unique and refreshing. I enjoyed the depth that the characters were given, even though this book was meant for a younger audience. Passage to Avalon has already made its way onto my Top Ten of 2018 list and I eagerly await the sequel.